The Nordstrom Anniversary Sale starts Early Access on Thursday July 12th, 2018. Below are some answers to FAQ’s about the sale and how to shop the Nordstrom anniversary sale if you are in Canada. The Nordstrom Anniversary Sale (aka. the #NSale) is an annual sale in which Nordstrom releases new fall merchandise at ridiculously discounted prices. This is different than any other sale out there, because these are not last season’s items on sale. These are brand new items from some of the biggest designers (think Tory Burch, Kate Spade, Sam Edelman) that are on sale for a few weeks only before going back up to regular retail prices. This sale is thus the BEST way to do your fall shopping! But, wondering how to shop the Nordstrom Anniversary Sale if you are in Canada? I’ve got you covered below. This year the #Nsale starts early access July 12th . The sale then opens to the general public on Friday July 20th and runs until August 5th; with prices on the items that had been on sale go back up to regular retail price. What is “Early Access” & Can I Shop it? Early Access runs from the 12th – 19th. To shop early access you have to be a Nordstrom cardholder. They have a credit card (obviously) but also a debit card – which operates exactly like your regular debit card, withdrawing from your bank account. Unfortunately, you cannot get a Nordstrom card without a U.S. billing address. I called and spoke with customer service at Nordstrom on the weekend to figure out if there was any way Canadians could shop early access to the online Nordstrom website without a card. Short answer? No. But don’t be disappointed – there are some things you can do! Read on for how to shop the Nordstrom anniversary sale if you are in Canada. There are two different options for you if you’re Canadian. This year for the second time ever, Nordstrom Canada does have early access to shop within the physical Canadian store locations. Similar to the US early access, to be able to take advantage of this early shopping, you need to be a Nordstrom Rewards Visa credit cardholder. The other thing that is important to note is that unlike the US, early access in Canada only starts three days before it opens to the public – ie. early access is July 17-19, 2018 (unlike the US which as stated above is July 12-19, 2018). My two cents on this? I’m happy to see Nordstrom is at least trying to get something in place for Canadian’s to more easily shop the sale, but, considering it is not online and is only 3 days of early access, it’s certainly not the most amazing deal. 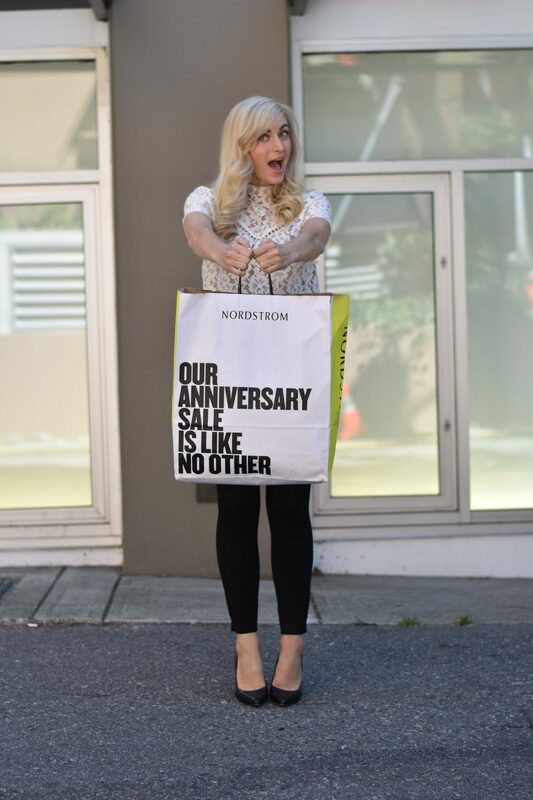 There are better ways to shop the Nordstrom anniversary sale if you are in Canada. The catalog is out now and lists a number of the items that will be part of the sale. Go through this now and make a list of the items you want – and put them in priority order. That way you can search for them one by one and add them to your cart right away on July 20th. So many bloggers are obsessed with this sale, that chances are pretty good your favorites will do at least one (… or 5) posts on their picks from the sale throughout the early access period. This is another great way for you to see some of the items you may want to get come July 20th. I know this sounds ridiculous, but items in this sale go FAST. The most popular items often sell out on the first day. So, once you know some items you already love (from the catalog & your fashion blog research) go and purchase those right away! You can shop the rest of the sale to see if there are other items you want after you have done that. (4) Don’t forget the Canadian Dollar! Once you are on the Nordstrom website you can go under the shipping tab and change your preferences to see the prices in Canadian dollars. This will help you make sure you stay on budget! Also, keep in mind that that shipping to Canada costs $9.95 (as a flat fee). I hope you found this post on how to shop the Nordstrom anniversary sale if you are in Canada helpful! I also hope you get all the items you want! I’d love to hear about your wants/purchases – keep me posted via comments (here or on later blog posts.) I will be doing a updating my blog throughout the sale so be sure to check back frequently. As posts go live I will include their links below. Thank you so much! And yes you definitely should check the sale out!! I just finished all my purchases (i'll have them up for review on the blog next week!) and I was definitely impressed with the deals! Thanks Sarah! And same here! I can’t wait! I can’t believe this sale is already here!!! Last year was such a blast and I found so many goodies!! I know, I am so excited! Best sale of the year by far. Great tips for Canadian shoppers! I can’t believe it’s only a few days away now and I can’t wait to shop! Thanks so much Kim! Less than 24 hours now, woo! I’ve got my calendar marked and alarm set! So excited about this sale, it’s like a blogger Christmas! Hahaha I love the term “Blogger Christmas” and yes, yes it so is!! So excited for the NSale this year! I’ve got my eye on a few Fall pieces! Same here girl! Happy shopping! So happy you posted this! I can’t wait to shop! Aw thanks Kasey!! Happy shopping! It’s so much fun to shop! I am glad that Canadian’s can shop in store this year! Can’t wait to see what everyone is getting! It’s by far my favorite sale of the year! I can’t wait to shop! So many great tips! I can’t wait to stock up on fall items!